Have fun storming the dungeon. OrangePixel founder Pascal Bestebroer knows what we like. All of his iOS and Android titles benefit from retro-style graphics, user friendly controls and core concepts pulled straight from 80's and 90's arcade games that ultimately come down to shooting everything that moves. This continues with Heroes of Loot, a satisfying effort that is a cool homage to the Gauntlet franchise. 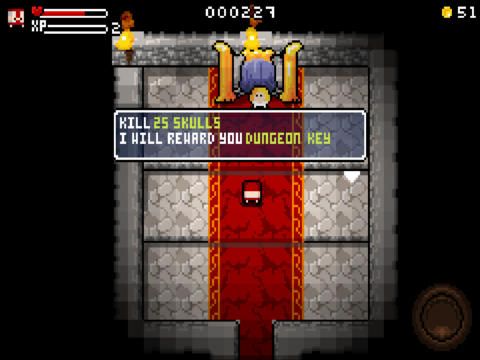 Suffice to say, fans of dungeon crawlers will find plenty to like about this $1.99 effort. One of the reasons we dig this game is its simplicity. It's a dungeon crawler without the fluff and major annoyances of recently released products. In other words, the story is virtually nonexistent, and there's no monthly subscription fee or in-app purchases. This lets you get down to the primary tasks at hand: killing as many creatures as possible and collecting copious amounts of trinkets along the way. To that end, Bestebroer was especially clever in the way he designed the game. Like some of the best classics, it doesn't have a conclusion per se. You play until you're dead. Not only that, but you lose all acquired items for that particular run. In addition, Heroes of Loot contains randomly generated dungeons of varying difficulties, so it's essentially a new experience every time. On top of that, there are four characters to choose from (Elf, Warrior, Wizard, Valkyrie), each of which differ in Strength, Magic, XP and the type of weapon used. 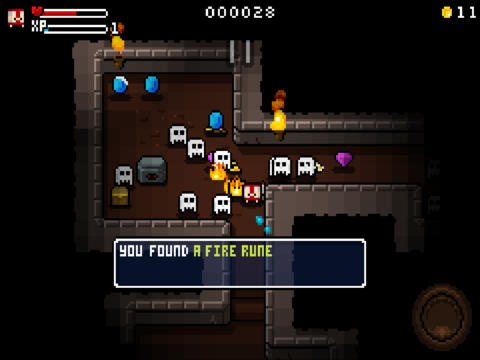 Random dungeons keep the experience exciting, and so do in-game challenges, where a non-player character tells you to destroy a certain number of ghouls, or pick up chests for bonuses; the number remaining is in the top right corner of the screen. With time limits to keep in mind, prepare for some intense missions. As for negatives, we think the developer should tweak the attack button for smooth 360-degree shooting. This would give Heroes of Loot more of an arcade vibe. Beyond that, you buy items in shops by walking into these objects, and a Yes/No option would have been key, as we accidentally lost quite a bit of gold at one point from bumping into something. Rest assured these are minor complaints. All told, this is another good game from OrangePixel, and a solid pick-up for adventurers who prefer to kill first and ask questions later. We look forward to updates in the months ahead. Review code provided by OrangePixel. What's Hot:Randomly generated dungeons, four different characters to choose from, quality soundtrack, no shortage of monsters to slaughter and items to grab, cool in-game challenges. What's Not:Attack button could use some tweaking, walking into items may result in accidental purchases.